With works by: ekw14,90 (Marlies Stöger, André Tschinder), Karin Fisslthaler, Andreas Kurz, Daniel Ladnar (Random People), Lucas Norer, Renato Osoy, Doris Prlić, H.K. Rannversson, Isfrid Angard Siljehaug, Iva Supić Janković. For Finding a New Order Doris Prlić and Marlies Stöger asked different artists and writers to reflect on existing structures or search for new ones. 11 artists followed the invitation and produced artworks or texts for this project. The contributions are published in this magazine and will be released on a website. 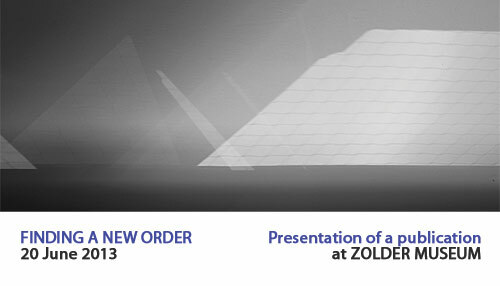 After the presentation at the Zolder Museum an exhibition in Austria will follow. No matter which political direction they are attributed to, European feature pages and contemporary philosophers seem to agree: Our current system has failed – be it political, financial or regarding the whole society. We need new ideas, new formations, a way out of the chaos. Censorship, rigid structures and mechanisation-if one searches for an enemy, it is never hard to find such a one. But where to find a solution? Artists, however, have been busy with these issues all along. Nevertheless, the art world is trapped in exploiting mechanisms and rigidity just as well. Hierarchical systems, gate keepers and top dogs maintain structures directing who displays and who doesn’t. Yet, wherever hierarchies exist, those who criticize them are not far. Since the number of visitors is limited it is important to announce your presence via email.